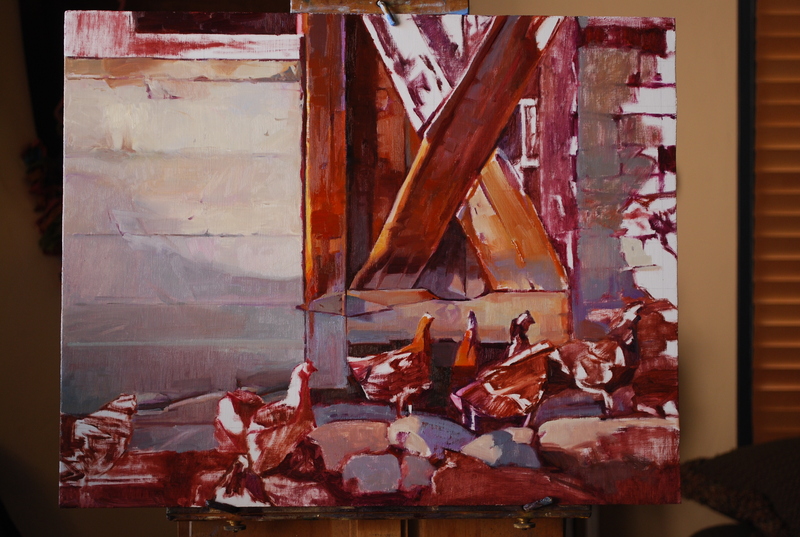 Last night was the beginning of final paint application on a 16 x 20 inch painting of chickens. The first of FIVE paintings I will do in the next FIVE weeks. With a chuckle I begin with chickens. When I was 8 years old I drew a picture of a chicken on notebook paper while sitting with a friend on a cool, cement porch in one of America’s 1960ish suburbs in Idaho. My drawing was smeared and messy, but, I remember thinking, “That was fun!” So began my 50 year art career. The title of this painting is: “Some Left the Meeting at the X with Ruffled Feathers”. This entry was posted on April 27, 2012 by dilleenmarshwomanartistrenaissance. It was filed under Uncategorized .